You know times are changing when there are more non-Asian establishments opening up than Asian ones in Chinatown. Call it gentrification, the declining relevance of Chinatown or the growth of Richmond as Chinese-central; interesting things are happening. Driving by on Pender reveals boarded up iconic shops and then further down on Georgia and Union, we begin to see non-traditional shops opening up. It also speaks to the shifting demographics of Strathcona. 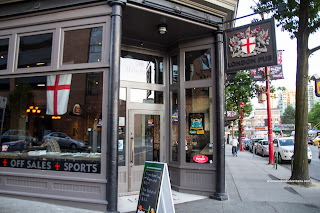 Whatever the case, we were doing our usual Monday night softball game at the nearby ball field and decided to hit up one of these new establishments being the London Pub. 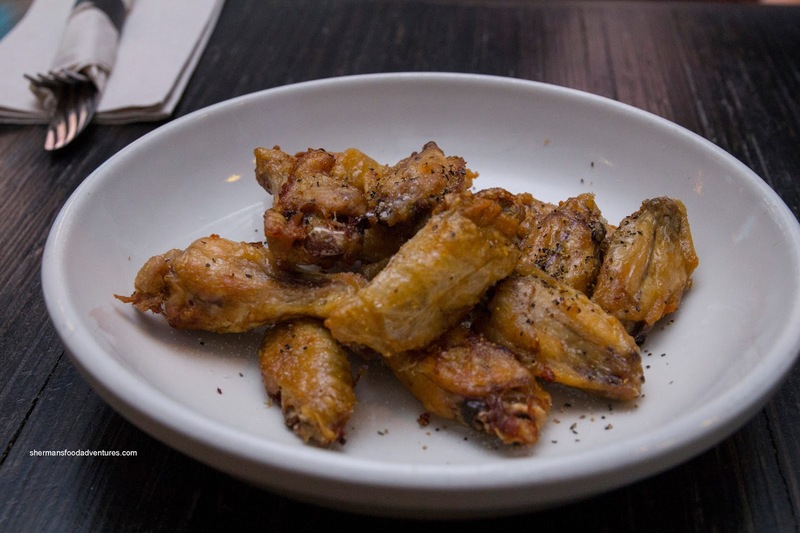 Milhouse and I started with the Salt & Pepper Wings ($12.00). We found them to be rather dry and over-fried. Sure, the skin was crispy and nicely rendered, but the meat was devoid of moisture. Furthermore, for salt and pepper wings, they weren't really salty nor peppery either. 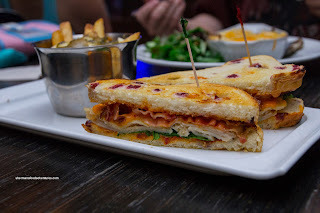 I tried the London Pub House Sandwich first ($12.00 + $3.00 for poutine). It was constructed of smoked turkey, bacon, cheddar, leaf lettuce and sundried tomato mayo within 2 slices of cranberry sourdough. The bread was toasted nice and crunchy while the ingredients seemed to work well together. 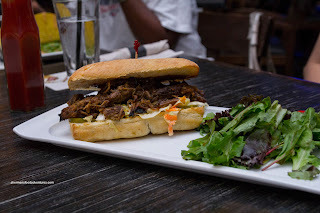 I liked the ample amount of mayo as it provided the necessary moisture to the dry bread. One thing we would've liked to see was crispier bacon. 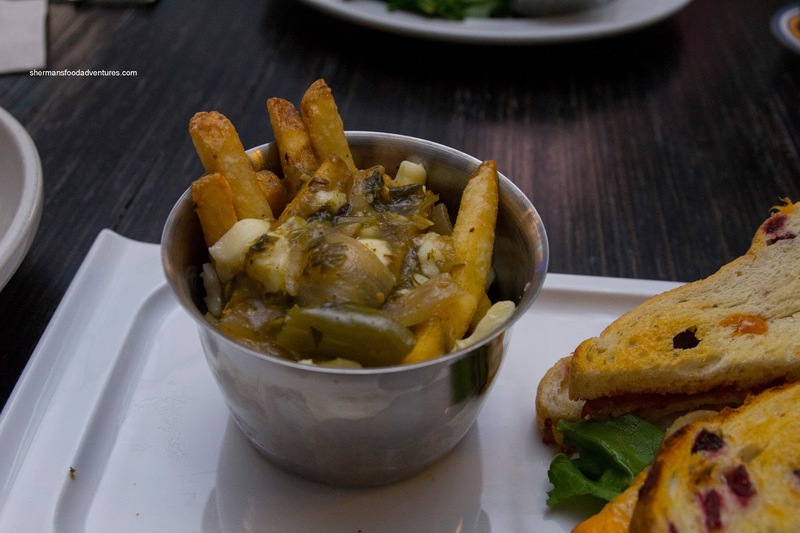 We ended up substituting the Green Chili Cheese Fries for the regular fries. This was their version of poutine where the green chili sauce served as the gravy. I found it tart and not that spicy, but as I dug deeper, it was did have a nice kick. As for the cheese, let's just say they were not actual cheese curds. 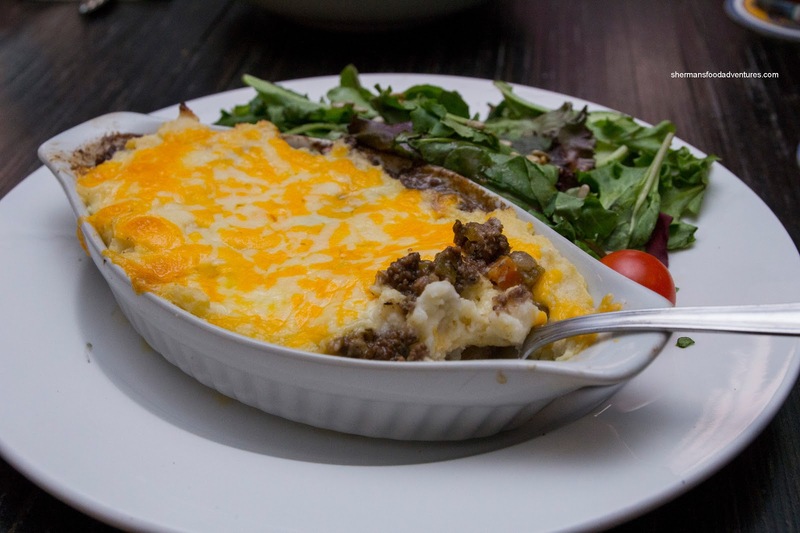 After finishing half of the sandwich, I moved onto the Cottage Pie ($14.00) consisting of slow cooked ground beef, stewed with Guinness and roasted root vegetables topped with mashed potatoes and cheddar. This was very much like a Sheppard's pie, except with melted cheddar atop the potatoes. The ground beef was in medium sized pieces and was easy to chew. I liked the little firm cubes of sweet carrots strewn throughout. Flavourwise, it was quite mild with a meatiness to it, however, I didn't get much Guinness. The side salad was sad and wilted due to be in the proximity to hot food. Judes ended up with the Strongbow Pulled Pork Sandwich ($14.00) which was not really her thing. The meat was rather dry and jerk-like with large chunks of inedible burnt pieces. I personally liked the slow-rumbling heat to the sauce, but she thought it was too spicy. 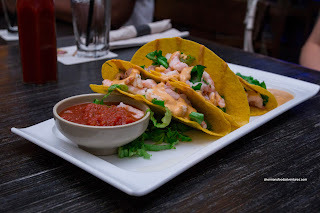 Hot Chocolate went for the Tequila Shrimp Tacos ($10.00) consisting of 3 hard shell tacos filled with Tequila-lime marinated shrimp and shredded lettuce. It was served with house made salsa and chipotle crème. She thought the shrimp were far too small to have any real impact while the flavours were muted. The use of hard tacos didn't seem to fit with the ingredients whereas a soft taco may have been less overwhelming texturally. 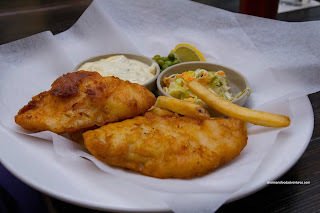 Lastly, Boss Woman had the British Fish & Chips ($15.00) which came with minted peas, coleslaw and tartar sauce. She remarked that the fish was moist and flaky with a crispy batter. It wasn't too greasy either. 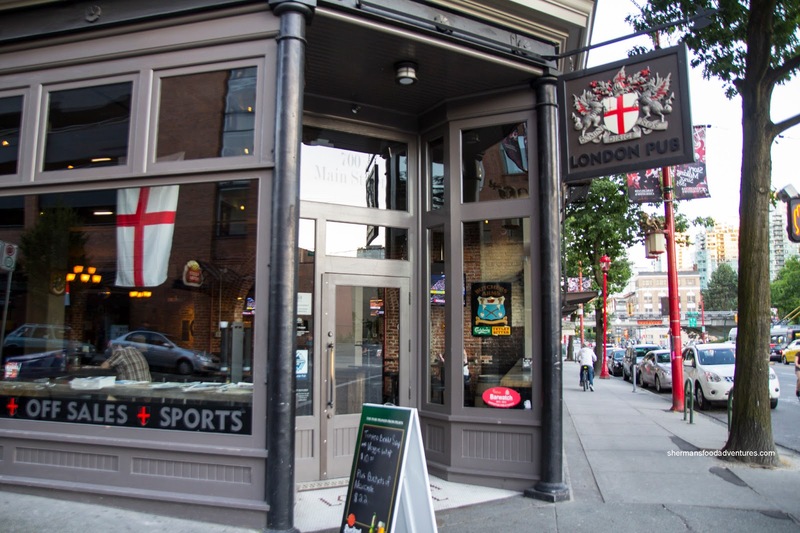 Overall, we found the food at London Pub to be "meh". Seeing how it took 45 minutes for it to arrive, the overall experience was disappointing despite the pleasant staff. Walked by several times. They look more like a sports bar from the outside. Judging from the pics alone, I've had better (and cheaper) eats at The Rumpus Room. Sadly, Chinatown is starting to be over run by hipsters and overpriced food. The concept worked for Gastown, but I miss the Chinatown I grew up in. It's too bad that none of the children of the first generation business owners wanted to take over the business that their parents worked so hard to build and to finance their educations. @Holly - me too, although I didn't grow up in Chinatown, I had family connections (Ho Ho Restaurant) and many other fond memories. The same is happening in Sunset neighbourhood (49th/Main) with the Punjabi population. @LR Yah, go for the drinks. Avoid the food. @Holly I miss the ol' Chinatown, but you gotta admit they didn't adapt to changing demographics.